Pack the essentials—phone, cash, cards, keys—in this fashionable, functional, and Earth-friendly pouch. Even when we don't need to bring along the laptop, gym clothes, book, lunch, and small power tools, there's one thing that always comes along: our phone. 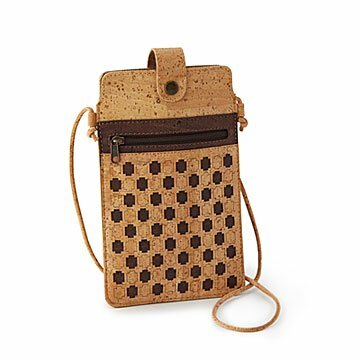 This crossbody holder is a triple threat of awesome: Fashionable, functional, and Earth-friendly—it's made of light yet durable cork, which happens to be a neutral color that goes with everything. (Thanks, nature!) Bonus feature: a hidden tab that makes your phone easily pop up from the pouch. There's also room for cash, cards, and keys, because by "one thing" we mean four. Made in Portugal. 7" L x 3.5" W Strap: 23"
Wipe off with a wet cloth and mild soap and let it dry.